LinkedIn and other social networks are becoming the bridge between millenial students and the academic world. Dean Mike Henry of Thompson Rivers University demonstrates how modern recruiting works without geographic boundaries and time zones. Under his watch and initiatives, enrolment soared by over 500%. Kamloops, Canada, April 16, 2019 --(PR.com)-- Thompson Rivers School of Business and Economic (SoBE) is quietly building one of the most advanced modern marketing programs that range from traditional and foundational marketing to digital and social media marketing led my one of the world’s most respected digital marketers, and Forbes Top 30 Most Influential Social Media recipients: Julio Viskovich. Thus becomes the amazing story and journey of one young man all the way from India. The journey began by Sajeesh reaching out the SoBE’s Dean Mike Henry to establish a relationship. This is the new way prospective students want answers from university administrators. Dean Mike Henry has been at the forefront of transforming SoBE into a modern and digital environment by leading by example and being accessible to both current and prospective students on LinkedIn, Twitter, and other platforms. Today’s modern and mobile-first students no longer respond to traditional forms on recruitment, but seek to go directly to the source. Dean Mike Henry is one of the few Deans in the country that actively engages prospective students on LinkedIn and this approach appears to be fruitful. 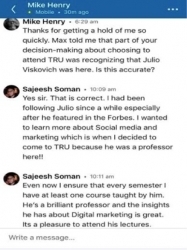 TRU’s SoBE has seen an uptick of over 500% in new students over the past couple years, and interaction between the Dean, or faculty, with prospective students is no longer just a pilot but a newly developed and successful recruitment method for universities. Universities can no longer disregard social media as a way to recruit and connect with both prospective students and current students. Sajeesh has since kept his promise and travelled all the way from India to take courses from a professor he has been following for years and has since become a colleague and mentee of professor Viskovich – all because of the power of social media. This highlights the need for senior leadership and faculty alike to take advantage of social media to build thought leadership and to modernize the way school’s recruit. LinkedIn and other social networks are becoming the bridge between millenial students and the academic world. Dean Mike Henry of Thompson Rivers University demonstrates how modern recruiting works without geographic boundaries and time zones.